We really do love country wedding hire work; it gives us the opportunity do what we do best and to boast about it on social media all around the world and our team enjoys nothing more in their job than travelling to picturesque locations to building a spectacular marquee for warm and welcoming hosts. We have travelled to places such as Kangaroo Valley, Jugiong, Goulbourn, Mudgee, Hunter Valley, Blue Mountains, Blackheath, Bathurst, Corryong, Maitland, Yass, Tamworth, Casino, Bindi, Newcastle, Canberra, Bowral, Mittagong, Deniliquin and many other locations throughout New South Wales. 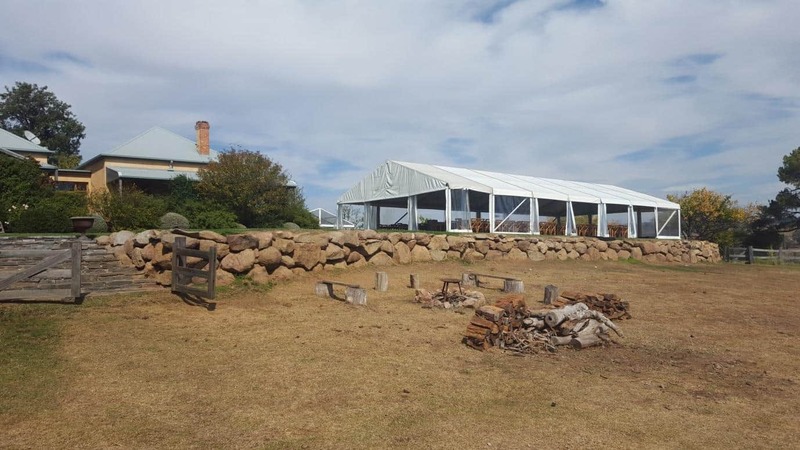 Because we travel long distances it is necessary for us to find local accommodation in the town, we usually allow 1-day travel and then 1 day to build depending on how far away the site is from our home base in Sydney and the size of your event, and we do the reverse for pick up. We have many solutions for your wedding or event, so please don’t be afraid to contact us to discuss your needs further, you will be surprised what we can do for you. But don’t take our word for it, see what other customers have said about our service here. Even more exciting we have developed marquee and floor systems that allow us to build in many difficult situations, particularly sloping ground. 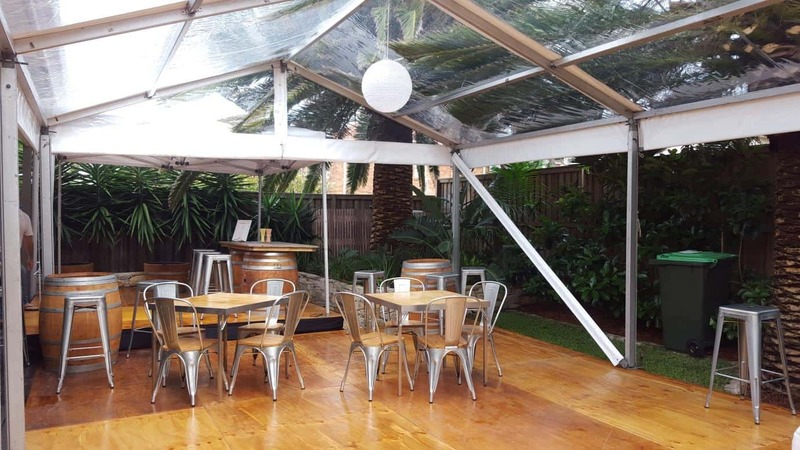 Furthermore we are currently developing a verandah system which will allow you and your guests to enjoy a view outside your marquee standing on a timber deck verandah attached to our marquee. At the above location the ground for the marquee fell 1 metre over 12 metres which required our unique flooring and handrail system along the raised sides of our timber floor, we also used our custom staircase as an access into the marquee. Each country wedding location has its different characteristics that need to be taken into consideration when designing our marquee and floor, Our Managing Director is a licensed builder and with more than 20 years experience in the Party Hire industry you won’t have to worry we are able to overcome the many problems associated with any site you are considering when you are planning your wedding. 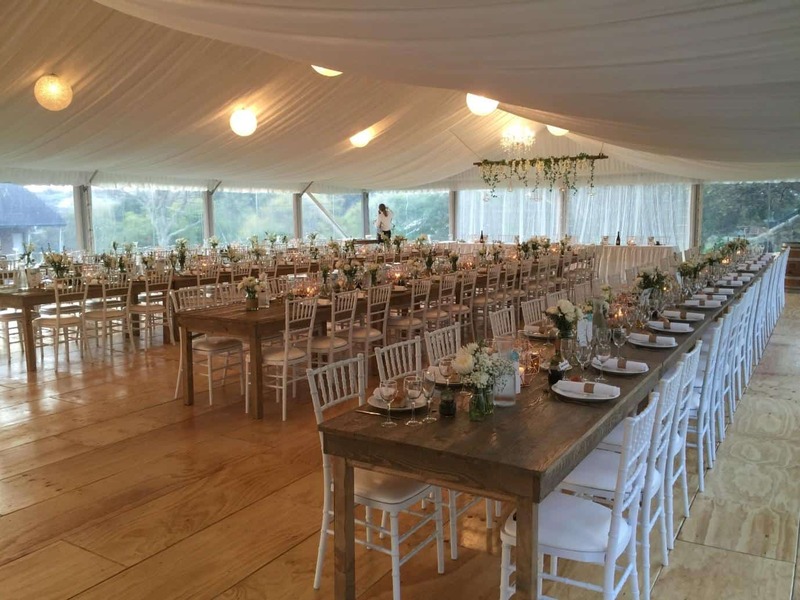 The above wedding near Jugiong was on flat ground with a great view over the surrounding paddocks, in this case we supplied a marquee, wood grain floor, rustic tables, timber cross back chairs and wine barrels, it made for a great rustic country wedding theme. 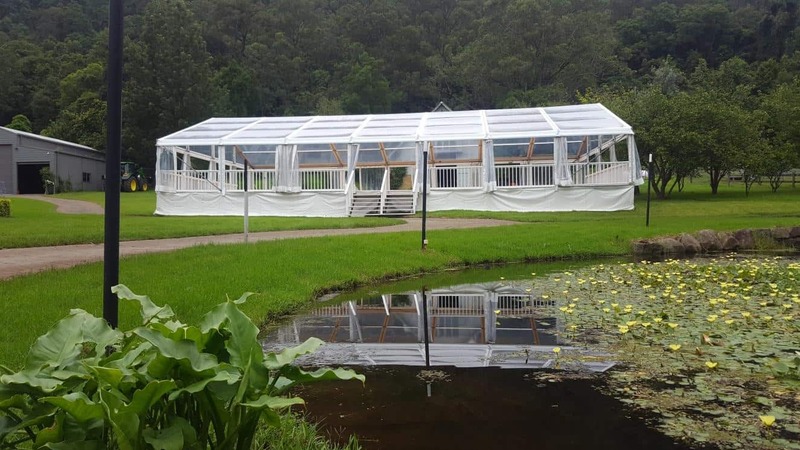 We can vary the style of the marquee to suit your theme with clear roof marquees, white roofs, white roof with silk lining, clear sides to enjoy the view or white sides to hide an object. As these are componentry items they can be mixed and varied as your need suits. For example, half of one side of the marquee could be white while the other half can be clear and so on. The finish of the floor can vary, as most times we lay timber grain floors these can be also covered with carpet completely or in part depending on your needs. We can even vary the colour as you wish, red, grey, black etc. Lighting is again another accessory that can change the appearance of to marquee. Most of our lighting is general lighting that illuminates the marquee for dining but for effect lighting you may require a specialist contractor. We supplied and install crystal pendant lights, chandeliers, plain polycarbonate ball lights, festoons and fairy lights. We have a great deal of party hire equipment other than marquees and floors that can be used for your event. 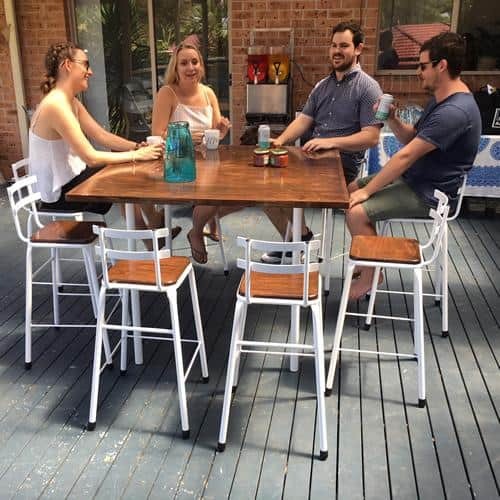 The range of tables we have to offer will satisfy most of your needs particularly our rustic table which is very popular and doesn’t need a tablecloth. Our chairs include a good selection of tiffany chairs, cross back chair and the tolix chair all very popular with wedding events. For a cocktail type of wedding we have developed the gathering table and the hampden stool, popular for an informal event where the seating of guests is fluid and not constrained by a rigid seating plan. 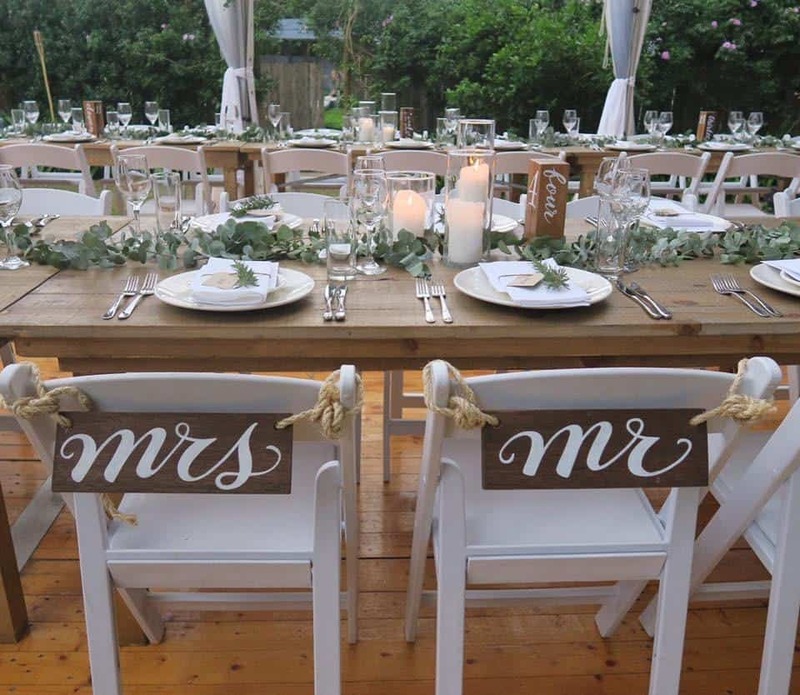 For table seating plans for traditional weddings we have table seating plans for each table on our website for you to view and hopefully this will help with your planning. We also have an extensive range of cutlery, glassware and china, essential when you are considering the dining needs of your family and guests. We supply polycarbonate glasses for those concerned about breakages, we also supply elegant crystal glassware for a more formal event and a standard glassware for the more budget conscious. This picture shows our tolix chairs, wooden barrels, and cafe table all set out in an open sided marquee with our wooden floor. This is an example of a marquee for a country wedding. It was installed at “Allview Escape” at Blackheath in the Blue Mountains. This is is one of our most popular country weddings venues. The picture shows our latest marquee and floor for a wedding. What a SPECTACULAR view! Below is a time-lapse video of the build for the floor and marquee at this wedding. If you are interested in a quotation from Walkers Party Hire for your next event, please contact our head office and we will be pleased to provide you a obligation free quotation for your event. If you decide that you would wish to proceed further we can help by providing marquee floor plans and table layouts of your wedding to help you make decisions on the size of marquee required. There are a lot of factors to consider when we prepare a quotation. 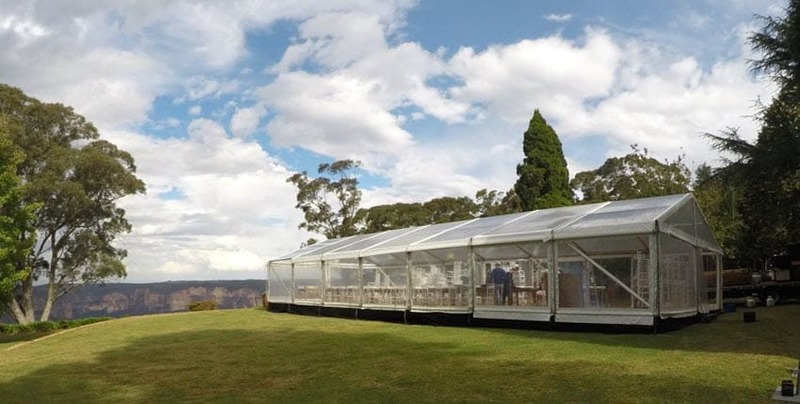 Site conditions are definitely important as there is a limit to how high we can raise the floor of a marquee on a sloping site to make it level. Access to the site is also important, the closer we can get to the site the better as carrying time adds to the cost of the job. How many people and what style of wedding is will determine the size of the marquee. If it is a cocktail wedding your guests will tend to stand and mingle more and therefore move around the marquee, if your wedding traditional your guests will tend to stay seated and not move around as much. Do you require a dance floor and band area? What type of dancing, pop style or cultural style dancing? Catering facilities, your caterer may require a separate marquee for food preparation and maybe buffet tables for serving food. These are all things that need to be considered when we are designing your marquee size. However we are not event planners and it is a good idea to appoint an event planner early in the planning process rather than later, this way you will have a better chance of achieving all of your wedding day plans. We can help you with the difficult decisions about what is needed for the site by doing a site inspection. Just let us know and we’ll provide more details. How Do I Know If My Site Is Suitable For Installing A Marquee?